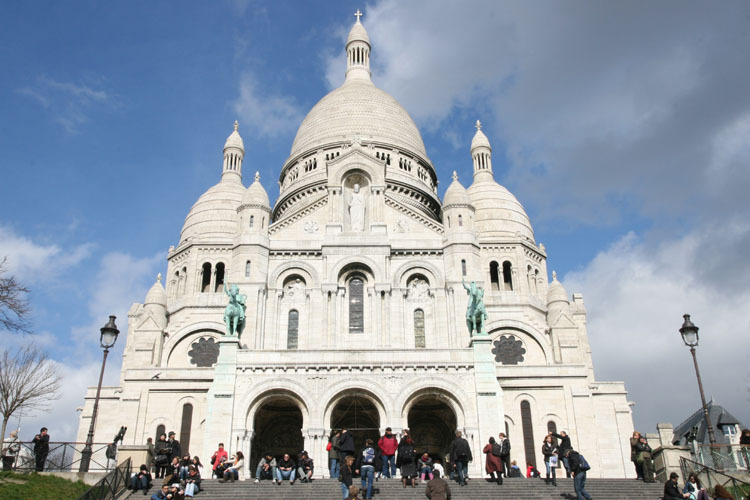 Montmartre in the north of Paris is primarily known for the white-domed Basilica of the Sacré Cœur on its summit. Many artists had studios or worked around the community of Montmartre such as Dalí, Modigliani, Monet, Mondrian, Picasso and Van Gogh. Along with this era came the famous taverns and dance halls - the Moulin-Rouge, and Le Mirliton where Aristide Bruant hurled insults at the bourgeousie who came to rub shoulders with the poor. The police also knew the Montmartre as the resort of gangs of Parisian toughs distinguished by their wide berets and corduroy trousers. The Sacre-Coeur was built at the end of the 19th century, its famous white architecture dominates the city, and offers a wonderful view. The church is on the site where Saint Denis was beheaded because of his faith in late IIIrd century. The basilica's construction was financed by every parish in France.